The Pacific Manuscripts Bureau offers the following Pacific history research materials online. The catalogues and papers are in digital format and are regularly updated. This document explains the digital image capture standards that the Pacific Manuscripts Bureau uses when digitising archival documents. It includes image capture standards for digital master and derivative files. This document explains the digitisation equipment and software that the Pacific Manuscripts Bureau uses when digitising archival documents. This booklet was compiled by staff of the ANU Library, the Pacific Research Archives and the Pacific Manuscripts Bureau for Causes and Consequences of Environmental Transformation in the Pacific: a workshop for staff and students of the ANU, 21 October 2011. It includes a summary of some of the Pacific resources that are held at the ANU for the study of environmental transformation in the Pacific. This is a catalogue of photographic collections relating to the South Pacific held throughout the world. It includes the provenance, date, region, record group and description, and the location and/or source of the collection. Please contact the Bureau if you know of other photographic collections that could be added to this catalogue. A gazetteer of obsolete / alternative names of the Pacific Islands with their current equivalents and A gazetteer of current names of the Pacific Islands with their obsolete /alternative names. This gazetteer was first developed as an aid to the use of PMB microfilms of log books of Yankee whaleships sailing in the Pacific. It was published as Part 4 of Bob Langdon's, American whalers and traders in the Pacific: a guide to records on microfilm (PMB, 1978). It was also published in the Pacific Islands Year Book (Pacific Publications), 12th-15th editions, 1977-1984. This 'cheat sheet' was prepared for students at the University of the South Pacific who attended an interactive workshop on searching the PAMBU catalogue. This presentation was delivered by Eve Haddow, ANU PhD candidate and Pacific Manuscripts Bureau Archives Assistant, at the Ke Au Hou - Generations of Pacific Librarianship Conference. The conference was held at the University of Hawaii Manoa from 1-3 May 2018 in celebration of the 50th anniversary of UHM's Pacific collection. The paper was co-authored with Executive Officer Kari James who was unable to attend the conference. The paper was part of the 'Honoring Our Past' panel, and told the history of PAMBU, starting with the discussions which led to its inception, through the achievements of the various Executive Officers to the present day. The paper reflected on the ways these legacies remain with us today and are constantly called upon as resources in our daily work. This presentation was delivered by Kari James, the new Executive Officer of the Pacific Manuscripts Bureau, at the PARBICA 17 Conference held in Pacific Harbour, Fiji from 4-7 September, 2017. The paper was titled ‘PAMBU: 50 years of Engaging with the Pacific Islands’ and was co-authored with former Executive Officer Kylie Moloney. The paper looked at the history of PAMBU - its origins, its purpose, its collections and some of the achievements of the various Executive Officers. It then looked to the overlapping priorities of the near future – engaging with the challenges and opportunities of digital technology, engaging with member libraries and of course, continuing our engagement with the Pacific. A big thank you to Kylie for her work on this paper even after moving on to a new role at the National Library of Australia. Vinaka vaka levu, Kylie. This presentation was delivered by Kylie Moloney, the Executive Officer of the Pacific Manuscripts Bureau, at the USP ANU workshop for Pacific history lecturers, Pacific librarians and archivists and Pacific studies lecturers. This workshop was held to celebrate the University of the South PAcific joining the Pacific Manuscripts Bureau. All USP students can now search and find digital content on the Pacific Manuscripts Bureau online catalogue. The presentation describes the work of the Bureau, the types of archival documents USP students can find in the PMB online database as well as other Pacific Resource collections throughout the world. This presentation was delivered by Kylie Moloney, the Executive Officer of the Pacific Manuscripts Bureau, at the Pacific History Association Conference in Guam, 19-21 May 2016. The panel title was "Revitalising Pacific library and archive collections". Abstract of the paper: What actually happens behind the scenes to make Pacific Island archives accessible? The Pacific Manuscripts Bureau has recently “gone digital”. Historical Pacific Island archive and photographic collections that were copied nearly 40 years ago by the Bureau on microfilm can now be made accessible online. Making these significant collections available online is challenging and time-consuming. The Bureau’s Pacific Island archive collections are a gold mine for Pacific Islanders and researchers, however the delivery and accessibility of these collections needs to be re-thought. This paper will discuss some of the challenges and successes the Bureau has had in making these historical Pacific Island archive collections more accessible and user friendly for researchers. Does advancing technology necessarily broaden audiences or does it simply make archives more accessible for some? Partnerships with those with digital access in the islands remains vital to expanding access to the Bureau’s digital collections. This presentation was delivered by Kylie Moloney, the Executive Officer of the Pacific Manuscripts Bureau, at the PARBICA 16 Conference held in Auckland from the 7 - 9 September 2015. It includes a brief history of the Bureau and the steps that were taken to move the Bureau from microfilm to digital copying and distribution. It also includes information describing the Bureau's digitisation equipment, software, standards and workflows. The Pacific Manuscripts Bureau uses ICA-AtoM as the online catalogue to describe and make digitised archival content available to PMB member libraries. The Bureau's microfilm collection is slowly being digitised and individual titles are being uploaded to the ICA-AtoM catalogue as resourcing permits. The presentation also includes images of fieldwork undertaken throughout 2015 in the Cook Islands, the Solomon Islands and Samoa. These images show how the Bureau undertakes copying projects in the islands today. - Carmel McInerny (Solomon Islands Broadcasting Company) - Powerpoint (3.9MB) and speech notes (24KB). 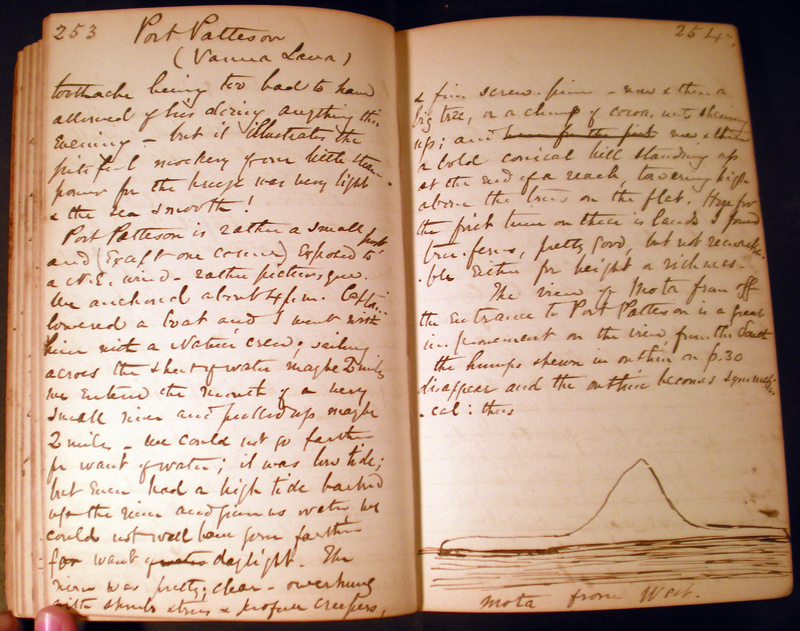 Harry Maude’s report attempted to systematically classify Pacific archives and manuscripts. Maude’s report was the basis for the formation of the Pacific Manuscripts Bureau in 1968 and set its agenda for many years. A broader assessment of the range and forms of Pacific archives is guiding the current operations of the Bureau. Ewan Maidment's paper was written to celebrate and review 40 years of archival collaboration in the Pacific Islands by the the Pacific Manuscripts Bureau. It was presented at the PARBICA, ARANZ, ASA Conference in Brisbane in October 2009. Search the Dorothy Shineberg database of indentured labourers in New Caledonia. A selection of papers from the Libraries and Archives Museum session at the Pacific History Association Conference held at the University of South Pacific, Suva, Fiji on 12 December 2008. A catalogue of objects from the Pacific Health Programs Exhibition held from 27 Jan to 6 Jul 2009 at the Menzies Building, Australian National University. 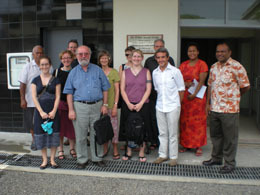 Some delegates from the Libraries, Archives and Museum session of the Pacific History Association Conference, visiting the Fiji National Archives, 2008.